The Taoiseach has come to the defence of the Health Minister, but won’t say if he’ll be reappointed if the government is re-elected. ENDA KENNY HAS moved to defend the increasingly embattled Health Minister Leo Varadkar by insisting that he is doing an “excellent job in a very difficult position”. Despite an initial honeymoon period Varadkar has, in recent months, been accused by opposition parties of dodging responsibility and accountability for the crisis in the health service. Fianna Fáil’s health spokesperson Billy Kelleher said last month that Varadkar needed to realise he is “not the David Attenborough of the Irish health services, observing from a distance while they career out of control”. Yesterday, Varadkar unveiled the HSE Service Plan for 2016 which will see the health service spend just under €13 billion next year. However, the HSE has predicted a €100 million funding shortfall for hospitals. Kenny was asked yesterday if he would reappoint Varadkar to the Department of Health if the government is re-elected next year, but he refused to be drawn on such a possibility. “It would be very presumptuous of me to presume anything – and I never do. What I would like to do is appoint the best cabinet I have,” he said. What the government will pay attention to is continuing to drive the recovery to have the engine. You need an economic engine to be able to provide for these many services in health, education, justice, defence and infrastructure. He insisted that the government is committed to introducing “universal health care” and ending the “two-tier” health system. This comes despite plans for universal health insurance being pushed back several years. Varadkar recently admitted it could be the coalition’s third term – if it gets one – before this happens. 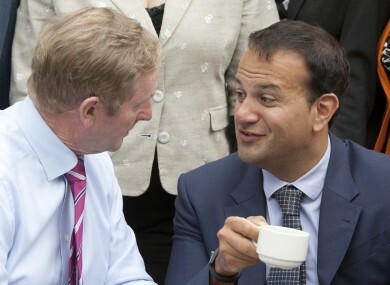 Email “Enda thinks Leo is doing an 'excellent job' in Health”. Feedback on “Enda thinks Leo is doing an 'excellent job' in Health”.